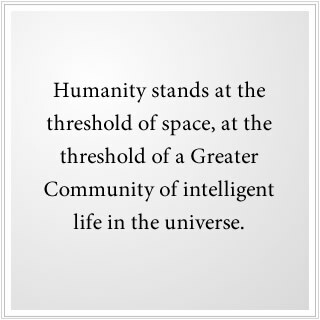 Humanity stands at the threshold of space, at the threshold of a Greater Community of intelligent life in the universe. Though there are great problems here in the world, and though humanity is facing the Great Waves of change that are coming to the world—environmental deterioration; diminishing resources; growing economic and political instability and the risk of competition, conflict and war—humanity has reached a great threshold in its evolution. It has reached a point of no return regarding its position within this Greater Community of intelligent life. Your isolation in the universe is over. From this point on, you will have to contend with various forces coming to the world, seeking to gain advantage here. You live in a beautiful world with magnificent natural resources. But your world exists in a well-inhabited part of space where there are many powerful technological societies who have established complex networks of trade. These societies, like so many others in the Greater Community, have outstripped their worlds’ natural resources and must now engage in a very complex arrangement of trade and commerce to gain access to the very resources that they need. Their technological advancement has not freed them from this need, but has indeed escalated the requirements of life. There are free societies within your region of space who are not part of these complex networks of trade, who have been able to maintain individual freedom and self-determination for their peoples. You are emerging into a complex set of circumstances. It is very unlike what most people think or speculate about regarding the possibilities of intelligent life in the universe. Many people believe the universe is a great empty place, and if life does exist, it is rare. Many people think that if humanity were to encounter another race of beings in the universe, this race of beings would be inordinately interested in humanity, and would want to help humanity and share their wisdom and technology with this young emerging race in the world. But, alas, the situation is very different. You are emerging into a very competitive environment where war and conflict are rare, but where the forces of influence and manipulation are powerful. You are emerging into a set of circumstances that are well established, and have been established for a very long time.